You’ve gone through all the pre-deployment briefings. You’ve prepared your finances, obtained the requisite Power of Attorneys, printed out the list of emergency phone numbers, and placed kisses in a jar for your kids’ deployment countdowns. If you’ve been through your spouse deploying a time or ten, then you’re well acquainted with our old friend, Murphy’s Law. With that in mind, just so we don’t jinx ourselves, we polled some of our military friends who shared their experiences with us about things we should absolutely never ever say while our spouses are deployed. 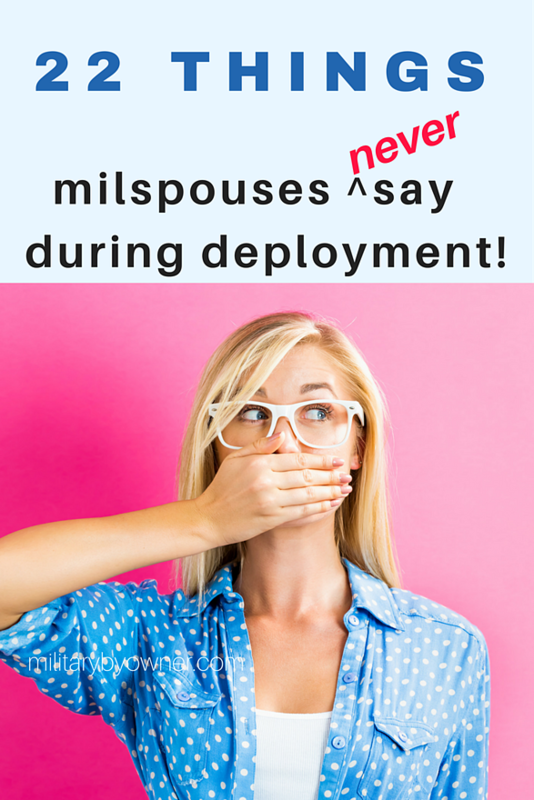 What YOU would add to these 22 things you'll never hear military spouses say during deployment? 1) I’m getting so much sleep! Let’s face it--the worry and extra responsibilities do not tend to equal good sleep! 2) None of the kids have thrown up recently. We’d never tempt fate this way...would we? 3) Of course! We’d love to have house guests! We love our family and friends, but we are most definitely not “company ready” right at the moment. 4) This is SO much easier than last time. 5) This Power of Attorney covers EVERYTHING. So glad I didn’t get the special ones that spell everything out. One thing you can you say about military families...we love our paperwork! 6) You know what hasn’t happened in a while? A blizzard canceling school for a week. Yes, we love our kids, but MilitaryByOwner writer Dawn M. Smith reminds us that too much of a good thing...well, it's too much! 7) Wouldn’t it be funny if there was a worldwide shortage of wine? 8) The “P word” (plan). We never ever say this. Because the best-laid plans are also subject to the demands of deployment! 9) Maybe my mother-in-law will come for an extended stay! Or another extended family member you don’t wish to spend that much quality time with...Now, just to be fair, some of us don’t feel this way, but this was definitely NOT the wish of this anonymous sharer. 10) Yep, all the cars and appliances are working GREAT! Why, why, why? Quick! Knock on wood! 11) Hey, honey, my computer stopped working. Can you fix it remotely? Nope, no way. Military spouses are known for their creative, can-do handling of life. We’ve got this! 12) SURE...since I don’t have anything to do or anywhere to go, I’ll watch your kids, too. Milspouses are the best friends and kid watchers ever, but let’s be honest, patience for more kids around is in short supply when we’re already solo parenting. 13) This is a good opportunity to get another dog. 14) Any talk even remotely referring to a specific deployment return date. Not just for OPSEC and PERSEC, but because there's no point in getting everyone's hopes up. It always changes! 15) It could always be worse! Because we know that yes, yes, it could. 16) I don’t have to cook dinner every night! Oh wait, yes I do….well, that’s what pizza delivery and drive-throughs are for! 17) Just watch, I’m going to try so many new recipes. Because cereal and toast can feature several times a week for dinner, no probs. 18) Deployment is the perfect time to have a baby! Ok, actually most military moms will agree that timing doesn’t really matter once you have that precious bundle in your arms! 19) The time is FLYING by! But is it…The time will pass--eventually! 20) Yeah, I needed a break. SO glad my spouse is deployed! 21) Excellent. I was hoping you’d get PCS orders while you’re gone. I just can’t get enough of packing up, listing, and selling houses alone! Nothing says love like showing your home to strangers while also getting ready for a move cross-country! 22) It’s only 5 days till Christmas and they’re almost home. No way they’ll extend this deployment! When it comes down to it, much as we may complain, we military families truly live the meaning of Mission First. And even though we agree that the above are things we wouldn’t say...one feeling is common as we tick off the days and our loved one is finally headed home. For more support for your military spouse life, check out our Ultimate Guide for Military Spouse Employment.